Hello!! I am so excited to be here at The Ribbon Retreat!! 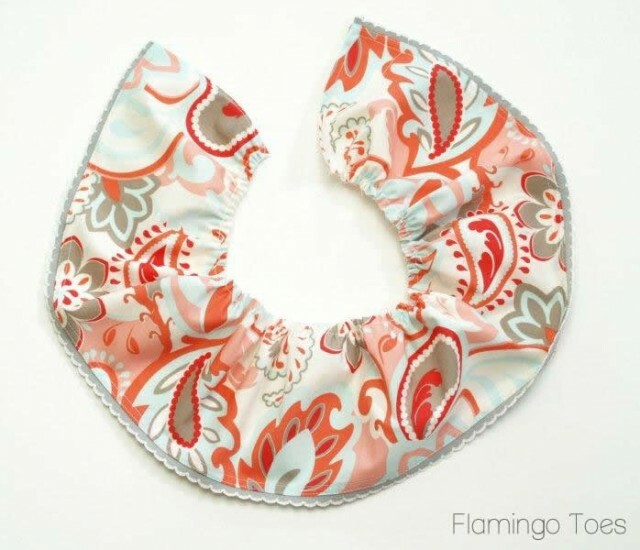 My name is Beverly and I am blog over at Flamingo Toes. I love to create jewelry, sewing and embroidery projects – and fun things for my house! 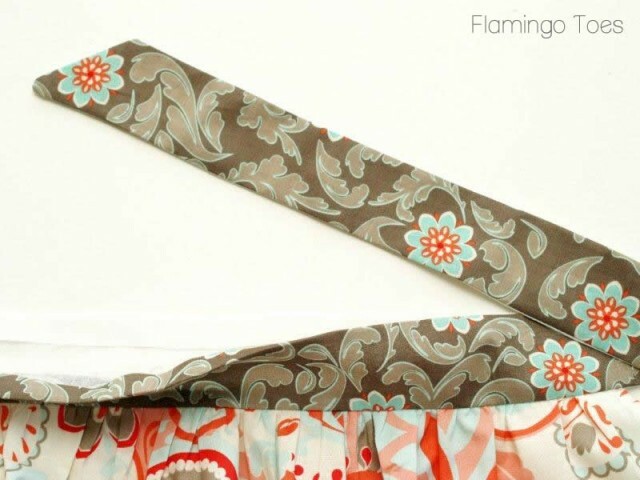 Today I’m sharing a fun Apron pattern – made with the gorgeous new Riley Blake line, Verona! 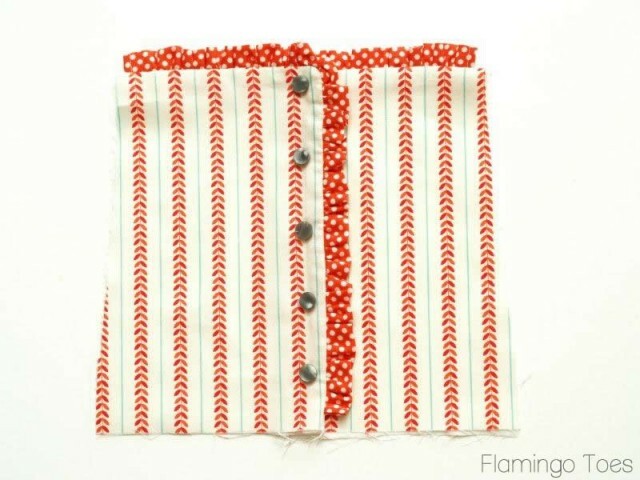 This fabric is so pretty – all red and blue and gray – and so fun for spring! 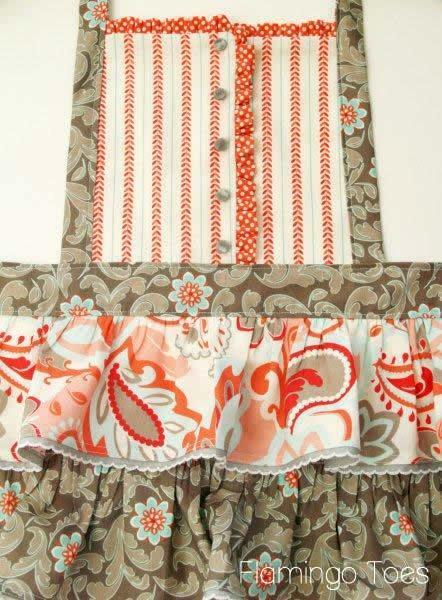 I’m really excited about this Apron – it has a sweet little buttoned top and layers of ruffles in the skirt. that I’ll be sharing here soon! Begin by cutting out your Apron top pieces. You’ll need two of your top fabric and two of lining. Cut pieces for the ruffles along the top of the Apron. 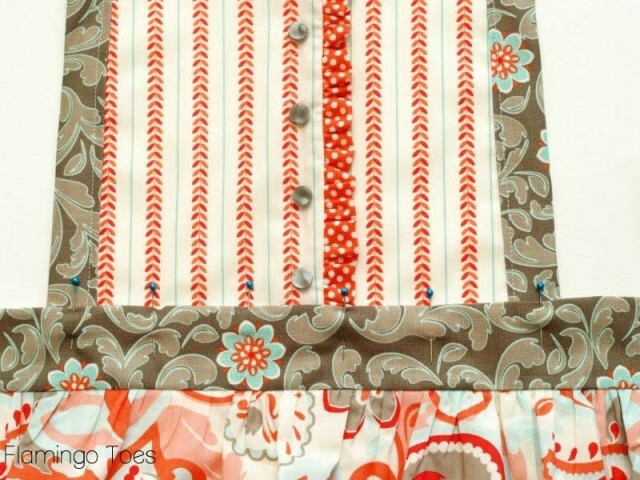 You’ll need one piece 10″ x 2″ and one piece 30″ x 2″ (if you are using a fat quarter, you’ll need to cut two pieces and sew them together to make this strip). 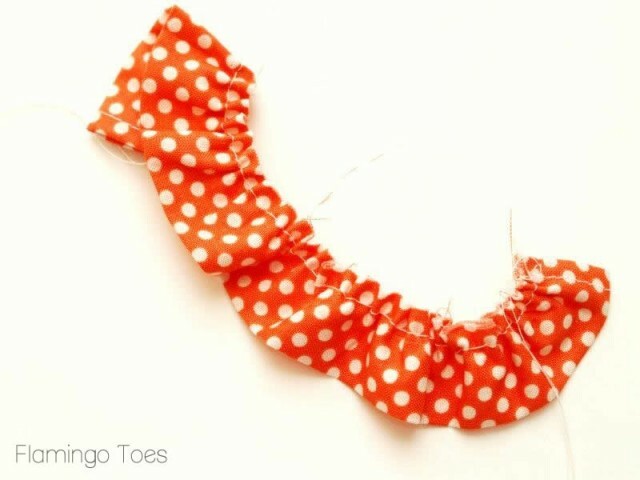 For the short strip, sew a tiny hem at each short end. 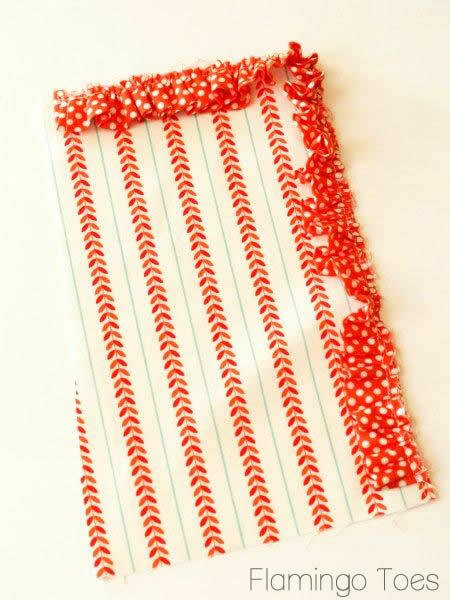 Fold the strip in half, long ways and sew a basting stitch along the raw edge. Pull up the threads to ruffle the strip to measure 5″. Baste the tiny ruffle to the top edge of the Right Apron Top piece. 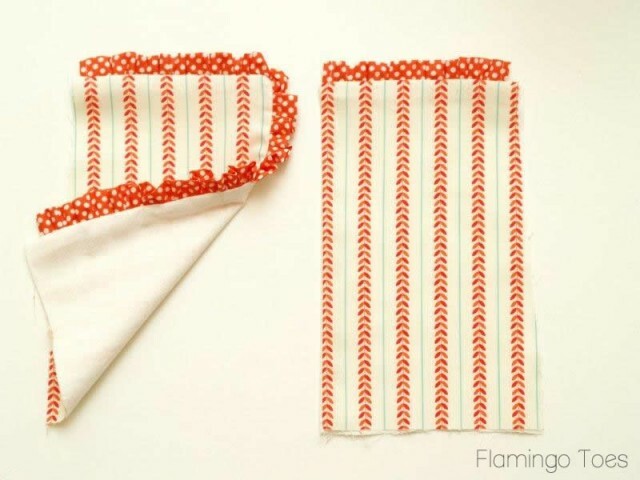 Make sure to start the ruffle 1/2″ away from the center edge. Repeat with the longer ruffle strip – Sew this strip to the top and right side of the other Apron Front piece. Sew the front pieces to the lining pieces, right sides together, along the tops and inside edges. Trim the corners and turn the pieces right side out. Press. The outside and bottom edges will be open. Lay the top pieces so the left side overlaps the right by 1 1/2″. Pin the top pieces in place. Sew 5 buttons evenly down the Apron top, sewing through both top pieces. The bottom button should be 1 1/2″ up from the bottom raw edge. Cut out your top strap pieces. You’ll need two strips 3″ x 36″. Press both long sides of each strip in 1/2″. Press each strip in half. Tuck the left side of the Apron Top into one of the Strap pieces. Sew along the strap 1/4″ from the edge, all the way down the strap. Fold the end at an angle and sew along the edge. Repeat for the right side of your Apron Top. Now we’re going to work on the skirt. 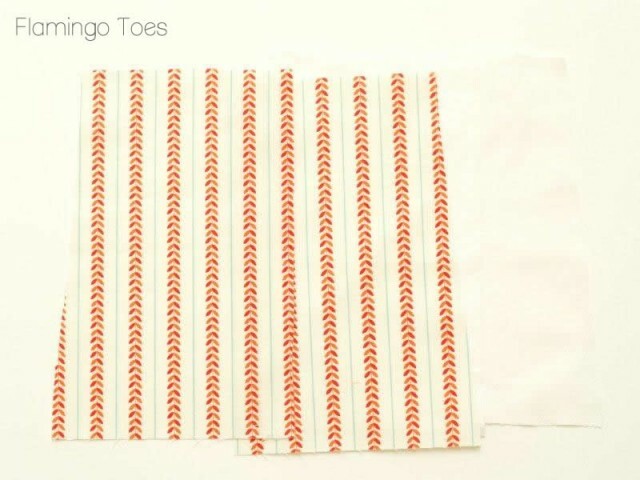 Cut out of your lining fabric a rectangle 16″ x 24″. Hem the two short sides and the bottom. Cut out your Ruffle fabrics next. You’ll need 1 ruffle from each fabric – 6 1/2″ x 44″. Hem the two short sides and bottom of each ruffle piece. 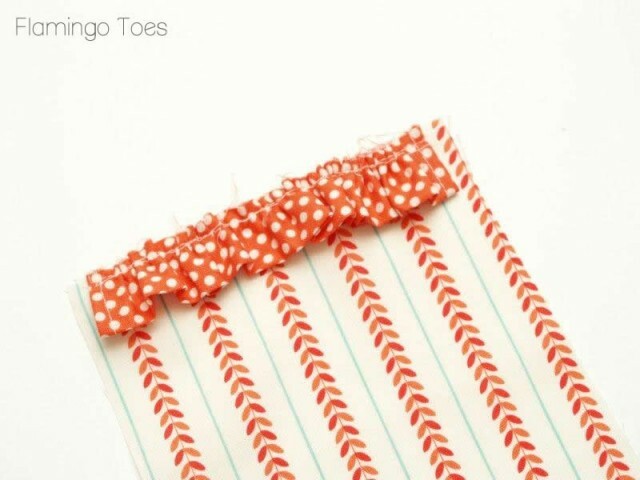 Sew a length of ribbon to the hemmed edge of each ruffle, so it peeks out under the hem. Sew a basting stitch along the top edge and pull up the threads to ruffle the piece. Sew the ruffle pieces to the underskirt, starting with the bottom ruffle. 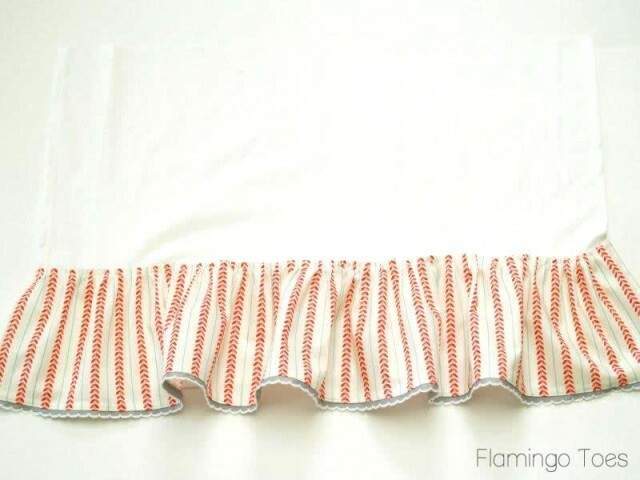 The top of the ruffle should be 5″ from the hem of the underskirt. Sew on the other ruffles. 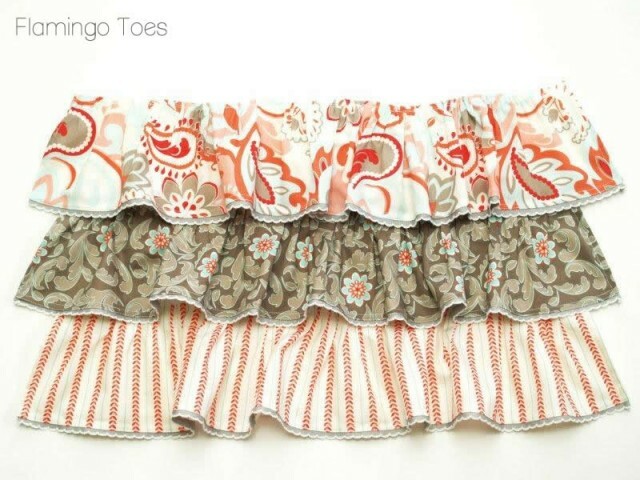 The second ruffle should be 5″ above the top edge of the bottom ruffle. The top ruffle should line up with the raw top edge of the underskirt. Cut out your waistband pieces. 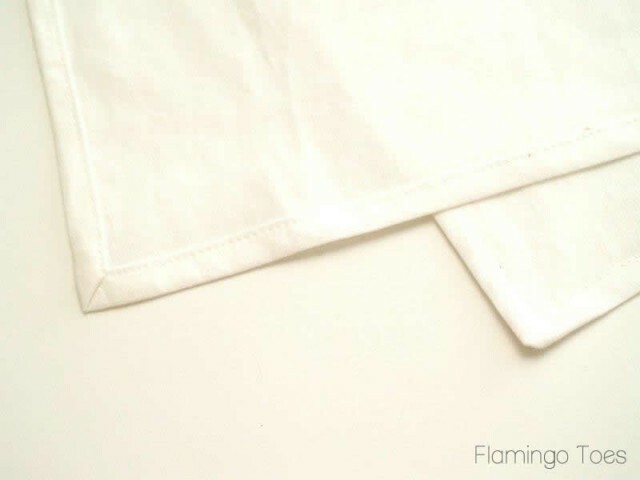 You’ll need a piece 25″ x 3″ and two pieces 27″ x 3″ of both the outside fabric and our lining fabric. 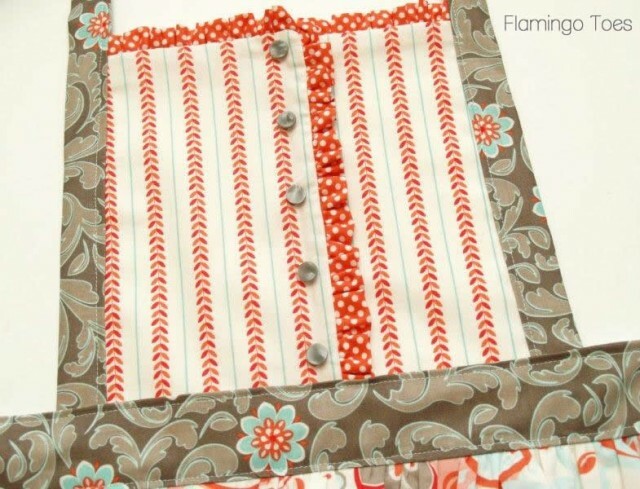 Sew the 25″ piece between the ends of each of the 27″ pieces for both the front and back. Pin the apron skirt section between the outer and lining waistband pieces. 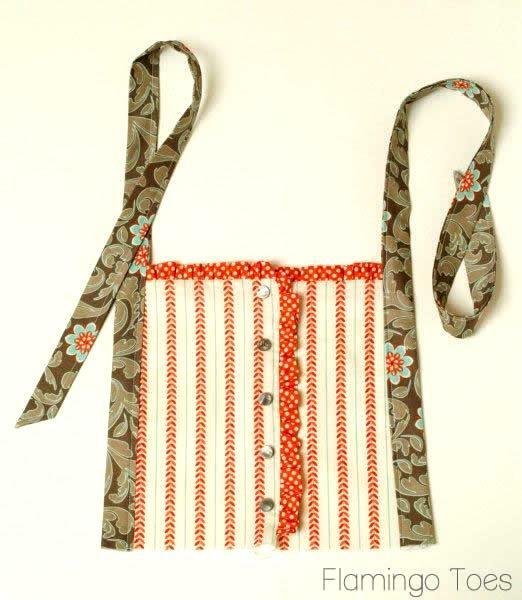 The right side of the waistband should be facing the right side of the apron skirt. Sew around the waistband top and bottom pieces, except for the bottom center section where the apron skirt is. 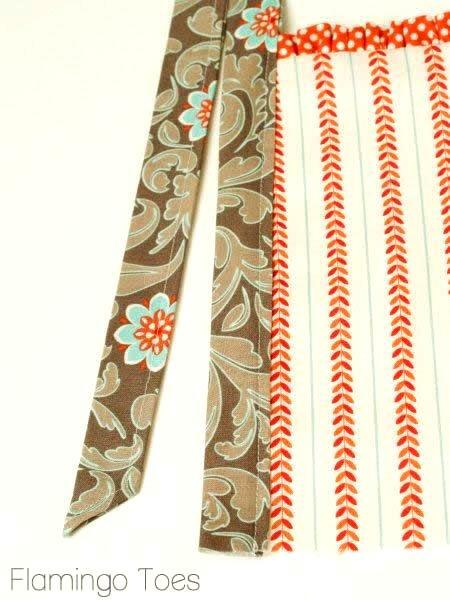 You’ll be sewing the apron ties together to make “tubes”. Turn the waistband pieces right side out and press. Press under the top, open pieces 1/2″. Tuck the bottom of the Apron Top into the opening of the waistband. Pin the Top in place. Topstitch around all the sides of the waistband 1/4″ from the folded edges, sewing the Apron Top into the waistband at the same time. Now you’re all finished!! You’ve got a super sweet ruffled apron – all ready for Spring! I think I need to make some Banana bread or something. 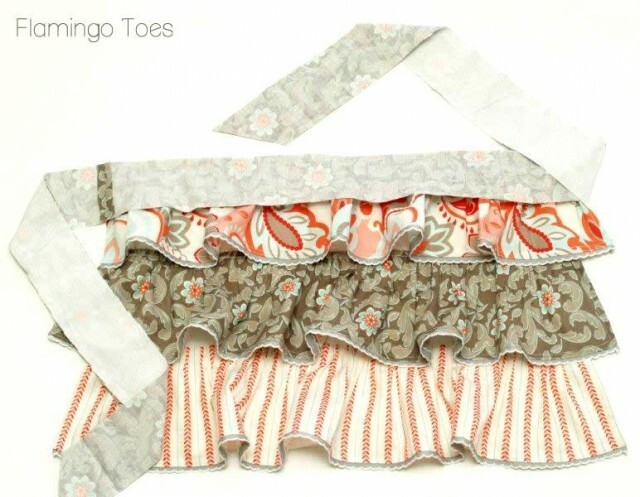 I hope you’ll come by Flamingo Toes and visit – you can check out my other Tutorials here! Thanks so much for having me guest post here at The Ribbon Retreat! Thank you so much Bev for sharing your beautiful tutorial. She has lots of wonderful things to share on her blog so make sure to visit! And check out more of Verona by Emily Taylor Designs for Riley Blake by clicking the link. This line is one of my favorites! Super cute, love the ruffles! Super cute! Love the ruffles and fabrics! I’m heading over to your blog! Come visit me too at LoveItSewMuch.blogspot.com – I think we will have a lot in common! Simply adorable! I love the colors and, of course, the RUFFLES!! Great design! Thanks for the sweet comments! And thank you to The Ribbon Retreat for allowing me to Guest Post – it was so fun! WOW, talk about UBER CUTE 🙂 that is a delightful apron. Very clever, thank you so kindly for your superb tutorial on it. This apron is DARLING!!! You did such a beautiful job:) Great tutorial; thanks for sharing your talents! It is December 10th, my granddaughter has requested one of these as a gift. I guess the machine comes out and I get busy. What a fun project to make.